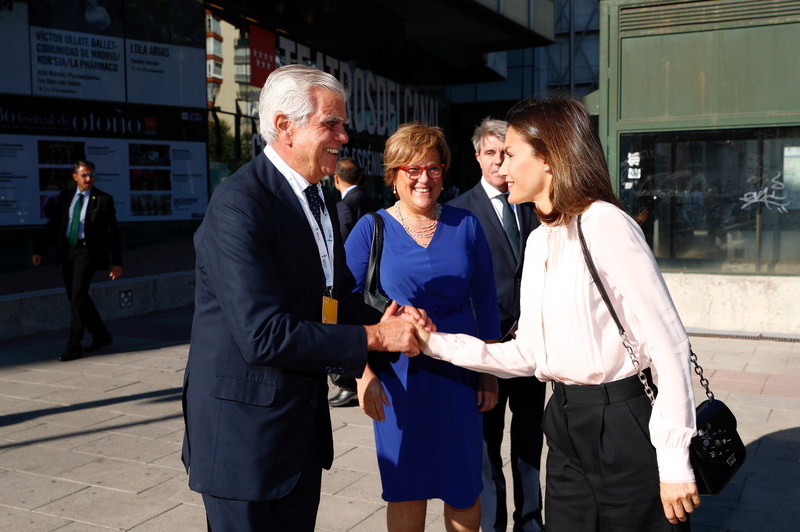 Today Queen Letizia was present at Teatros del Canal in Madrid to preside over the act organized by AECC on the occasion of the World Day of Research in Cancer and to present the “V de Vida” Awards 2018 to CRISPR technique, Francisco Martínez Mojica, Jennifer Doudna and Emmanuelle Charpentier for the contribution in Cancer Research. 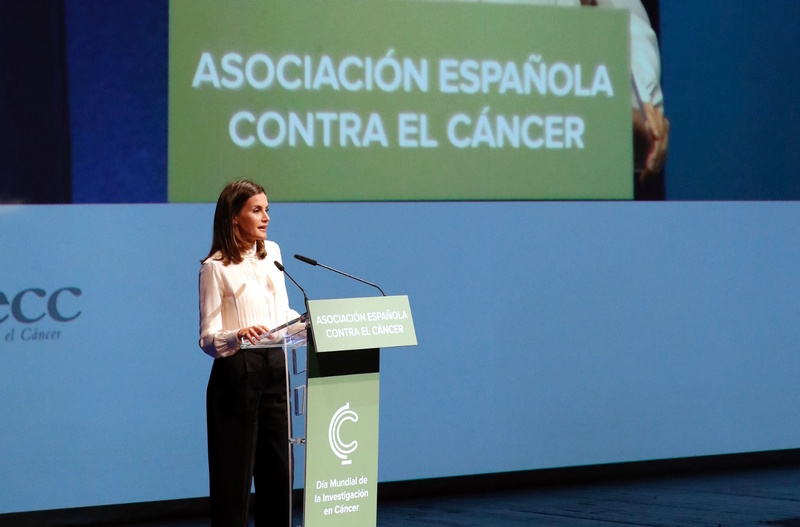 Queen Letizia is the Permanent Honorary President of the Spanish Association against Cancer (AECC) and the Scientific Foundation of the AECC. The “V de Vida” award is the annual recognition granted by the AECC to a person, institution, company or association belonging to any social sphere (political, business, sports, artistic, public, health, etc.) that has stood out for improving the lives of Cancer patients and their families. It is the commitment of civil society in the fight against cancer that is rewarded every year. 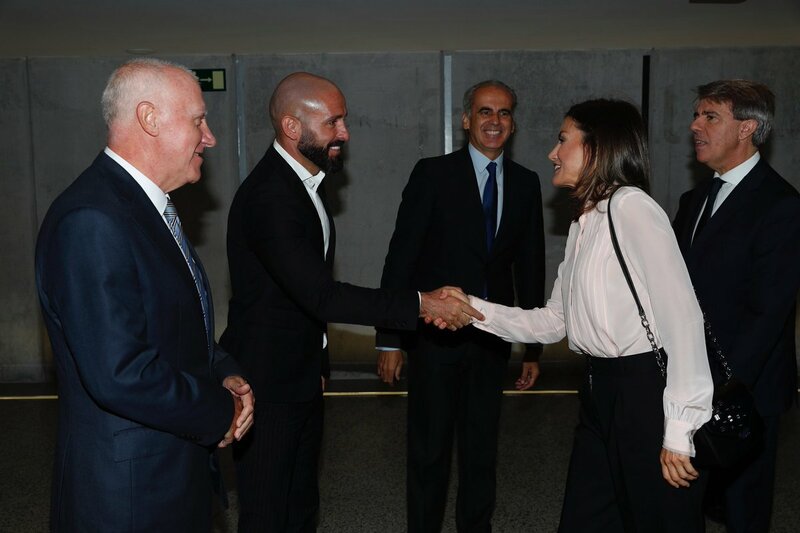 The event began with the presentation of “CRISPR-Cas9 genetic edited system project” by Emmanuelle Charpentier, microbiologist and biochemist and Francisco Juan Martínez Mojica, microbiologist, researcher and professor at the University of Alicante. After the presentation, Her Majesty the Queen held a brief meeting with the researchers, who received the grants, in which a video about the researchers and their work was explained. 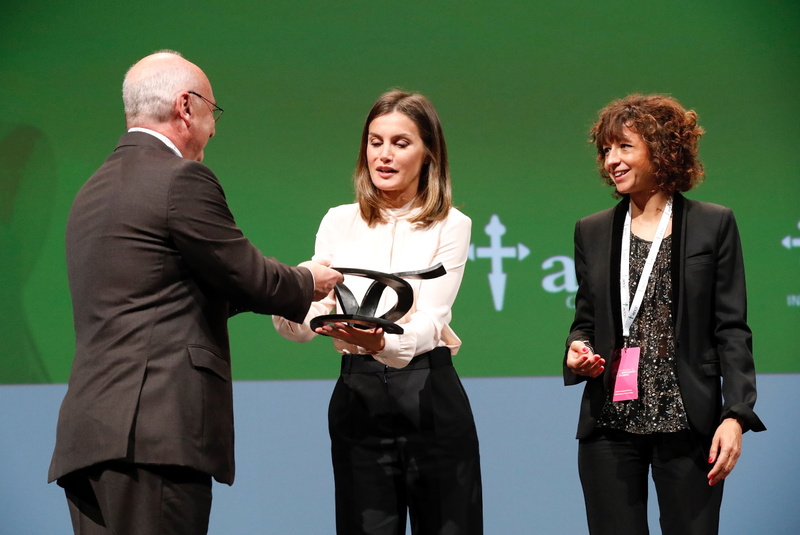 Later on Queen presented the “V de Vida” award in 2018 to Francisco Juan Martínez Mojica and Emmanuelle Charpentier. In 2005, Francisco J. Martínez Mojica published the discovery that sparked the CRISPR revolution. In June 2012, Emmanuelle Charpentier and Jennifer Doudna found how to use it to cut and paste DNA. Today thousands of laboratories around the world use CRISPR / Cas9 and have even begun to test their application in humans in treatments against several types of cancer. This technique, also known as the genetic “cut and paste”, could generate substantial changes throughout society in the not too distant future as it is already causing profound changes already visible in biology in general. 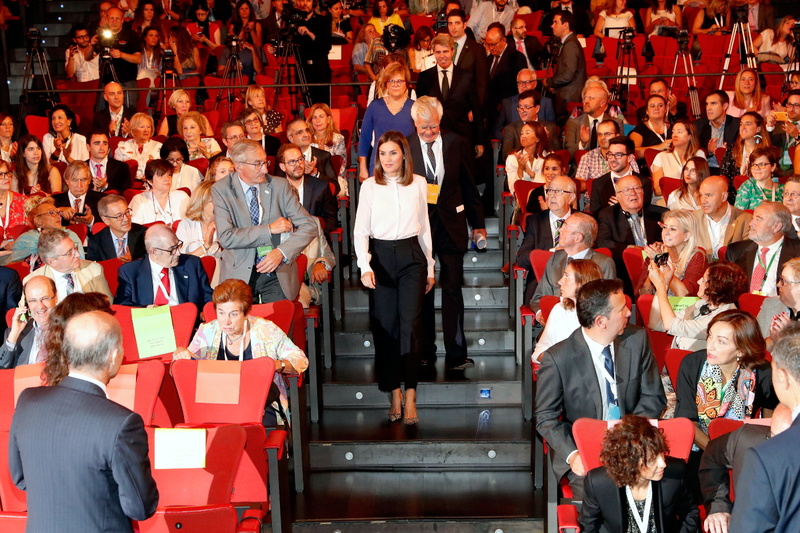 The AECC, which was established in 1953, is the first Organization whose honorary presidency Dona Letizia assumed on a permanent basis as a royal, and she actively participates in and promotes the important work of organization that has been going on for more than 60 years in the fight against cancer. 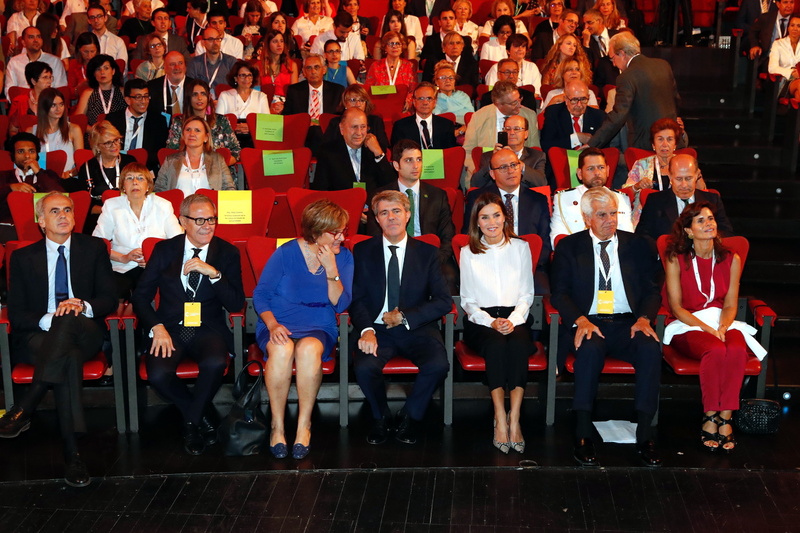 AECC has led the effort of the Spanish society to reduce the impact caused by this disease and improve the lives of people. The organisation integrates patients, family members, volunteers and professionals who work together to prevent, sensitize, support and accompany the affected people and finance research projects that will allow a better diagnosis and treatment of cancer. 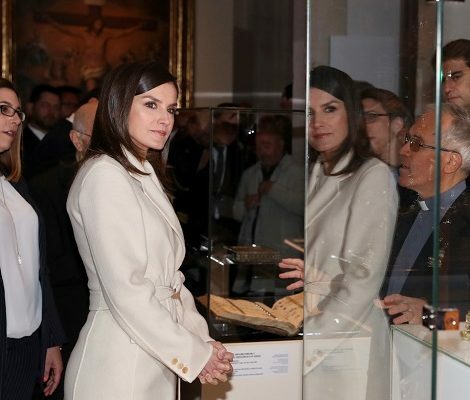 Today keeping her look minimal to make sure the focus of the day remain on the act and cause, Letizia chose a very somber yet effective look. She wore a powder pink Karl Lagerfeld Pleated shirt. 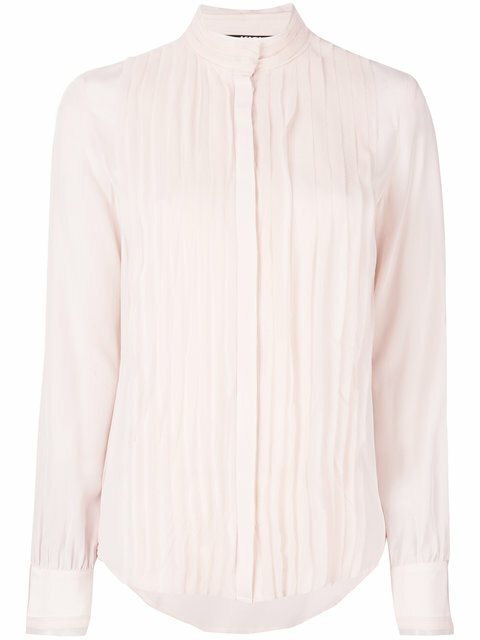 The new addition to her wardrobe, the silk shirt features mao collar with pleated front bodice and cuffs. The shirt is available in Spain for €128.52. Queen paired the shirt with a black paper bag trouser that she debuted in Girona last year. 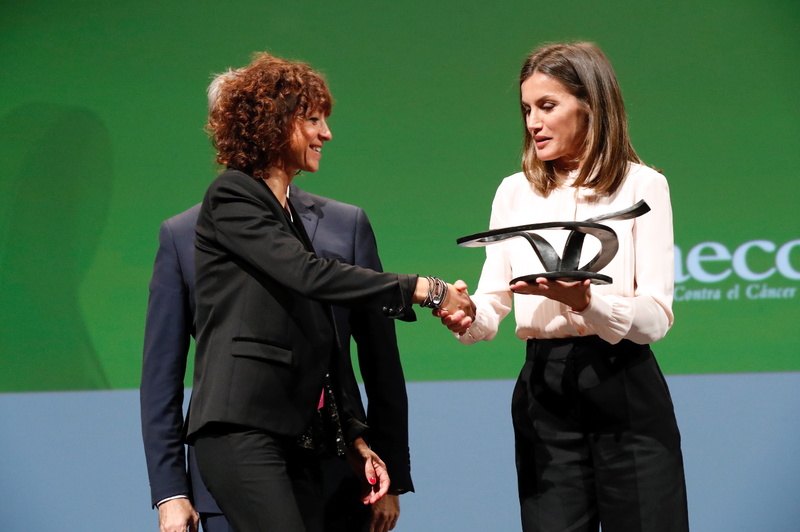 Letizia was wearing Magrit’s animal printed python leather pumps with studs at the front and back that she debuted at National Sports Awards this year in February. 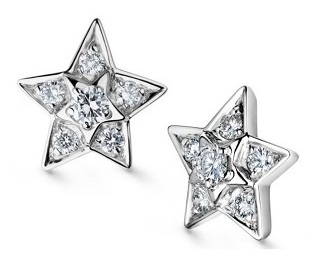 Her Chanel Comete earrings finished her look of the day. Queen was carrying a black sling bag today. But due to the lack of the clear pictures of the bag the label of the bag is still unidentified.